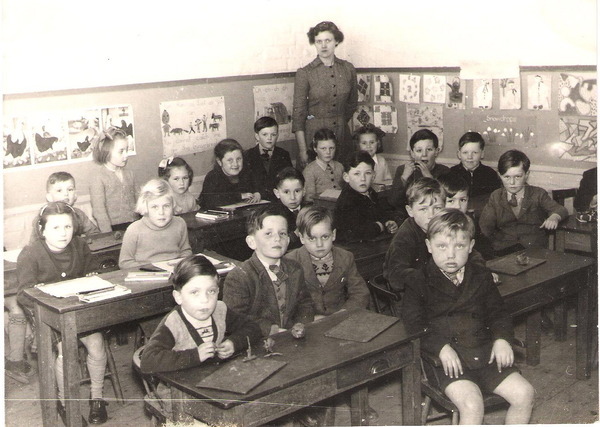 View Item » Infants Class, Lutton School, Lincs. Infants Class, Lutton School, Lincs. This is the Infants class at Lutton school, Lincolnshire, in 1954 or 1955. The teacher is Mrs Ida Neal. On the back row from left to right: Andrew Ashton, Rita Bailey (standing), Angela Bowd, Pauline Fiedler, Michael Gent, Pauline Gent, Jenny Knight. In the middle row from left to right: Sylvia Smith, Gloria Hall, Geoff Smith?, Colin Wright, Johnny Murfet, Graham Wilkinson. On the front row, from the left: Martin Harvey, John Butler, Peter Cooper, Tony Bunn, Michael Kirk?, Richard Wilkinson. Michael Bunn is seated right at the front of the class. LOvely! Room seems to have shrunk. Classrooms always seemed so big didn't they. Boys in short trousers - freezing legs in winter and I see a girl with 3/4 length socks. Garters were supposed to hold them up but they never did. Brilliant that you have the names, too.